UPDATE: Sedea has been found safe. A 14-year-old girl has been reported missing from Grande Prairie. Sedea Widow was last seen in the city on November 21st and police say there’s concern for her wellbeing. 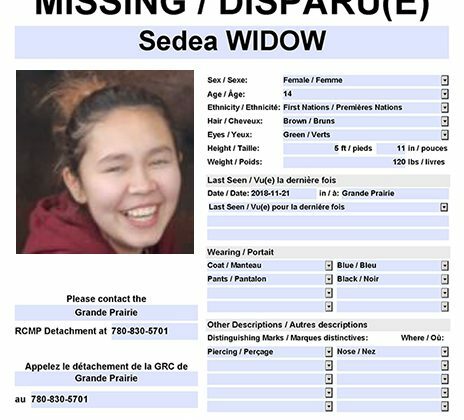 Sedea is described as First Nations, 5’11 and 120 pounds with green eyes. She also has brown hair with the ends dyed red and a nose piercing. The girl was last seen wearing a medium blue jacket with a fur trim, black pants, and black winter boots. 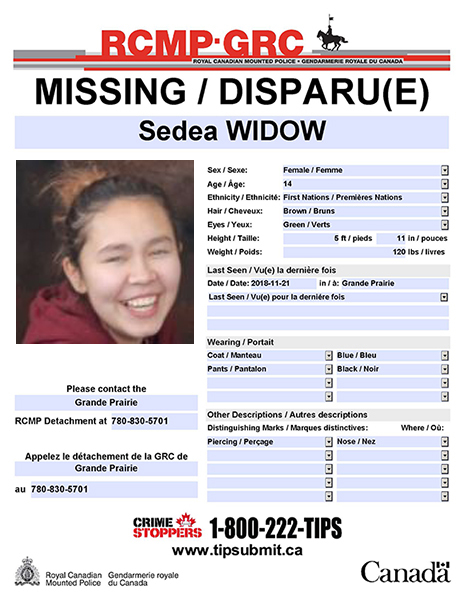 Anyone with information on Sedea’s whereabouts is asked to contact the Grande Prairie RCMP detachment or Crime Stoppers.